The hardcover edition is a volume in the Greenwood Guides to Science and Religion series edited by Richard Olson. At a list price of $65, its main customers are libraries. It was published in January 2006. In December 2007, Prometheus Books put out a paperback edition, including a new preface. It is much cheaper, listed at $21.98 and discounted down to $14.95 in places like amazon.com. It is my most introductory, most accessible, and cheapest book on science and religion. Can science and religious belief coexist? Many people—including many practicing scientists—insist that one can simultaneously follow the principles of the scientific method and believe in a particular spiritual tradition. But throughout history there have been people for whom science challenges the very validity of religious belief. Whether called atheists, agnostics, skeptics, or “infidels,” these individuals use the naturalism of modern science to deny the existence of any supernatural power. 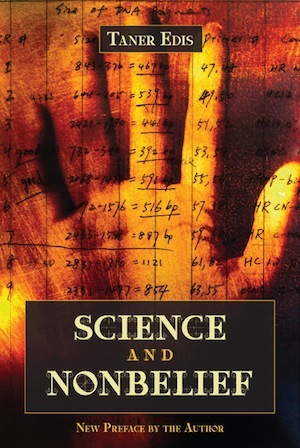 Science and Nonbelief chronicles, in a balanced and accessible way, the long history of the battle between adherents of religious doctrines and the nonbelievers who adhere to the naturalism of modern science. What place does evolution hold in the arguments of nonbelievers? What does modern physics tell us about the place of humanity in the natural world? How do modern neurosciences challenge traditional beliefs about mind and matter? What can scientific research about religion tell us about the nature of belief? How do skeptics react to claims at the fringes of science, such as UFOs and psychics? The volume also addresses the political context of debates over science and nonbelief, and questions about the nature of morality. It includes a selection of provocative primary source documents that illustrate the complexity and varieties of nonbelief.